John Aldridge on board the Anna Mary. John Aldridge is a 45-year-old lobsterman who, back in July of last year, fell overboard in the middle of the night into the breathtakingly cold waters of the Atlantic with nothing but his rubber boots to keep him afloat. After 12 long hours, a shark sighting and the execution of an exhausting but resolved plan, Aldridge was rescued by the US Coast Guard and treated for a few relatively minor medical issues before being released from the hospital. This story is an amazing tale of courage, positive thinking and intelligence. It puts many of the challenges of life and business into perspective. So inspiring was this story to me, I sent it to our entire executive team at Okyanos. After a snapped plastic handle on an ice chest sent Aldridge flying to the back of the boat deck and into the water, he plunged into the water at about 3:30 am. 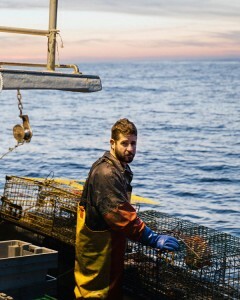 He later admitted he shouldn’t have been taking chances doing what he was doing, especially not in the middle of the night on the slippery deck of a lobster boat. But upon hitting the water, John quickly resolved to do whatever he needed to do to survive, and herein are the valuable lessons one can extract from his inspiring story (which is nothing short of miraculous). How does a man survive falling off his ship into the dark, chilly water without a floatation device, GPS beacon or any shipmates around to witness him slipping into the sea? Fisherman survival 101 says, if you fall overboard, you immediately kick off your boots—generally speaking, they’re heavy and they’ll cause you to sink. But Aldridge quickly spotted the potential of his boots to save him. Removing them from his feet, he trapped air inside of both boots and placed them under his arms. Now stably afloat, he assigned himself the task of staying that way until sunrise. John fought to stay positive. He decided, concretely, that he would think no negative thoughts. He stayed strong and recalled the promise he made to his family—that he would do everything possible to make it home safely should anything ever happen to him at sea. When the sun rose, John decided his next task would be to find a buoy where he would be more easily spotted by search parties. He couldn’t feel his fingers and he’d been awake for over 24 hours, but he made the exhausting swim and eventually landed at a buoy. He realized the search planes and helicopters—now visible to him—were unable to see him, and so he decided to go further east in order to be spotted. Aldridge then plotted a trajectory, heading east towards the search and rescue teams, making use of the force of the current and his knowledge of the surrounding lobster traps. He swam until he reached another buoy and fastened himself to it. Shortly after this, Aldridge was found and hoisted up into a rescue helicopter. This man was in the water for roughly 12 hours. He shivered uncontrollably, was at one point circled by 350-pound blue sharks and then watched his own ship, the Anna Mary, a quarter mile away (searching for Aldridge) disappear into the distance without him. Despite all of this, he willed himself to execute an intelligent plan that saved his life. Adversity shows up, at one point or another, in our relationships, our personal lives and business dealings. And although such challenges have the potential to alter our course completely, it is courage and strength in the face of adversity that enables our greatest challenges in life to become our most memorable and impactful experiences. Read John Aldridge’s full story in the recent New York Times article. Pictured Above: John Aldridge on board the Anna Mary. Wow. Great article, Matt. It shows the power of intention and what one can learn from it. I know I had a few difficult times in my life and surviving them and learning while going through them bred a competence that can not be obtained except through the pursuit of victory and its accomplishment. Thanks for sharing! Inspiring stories have much more value for us than what passes for “news” these days, and this is a good one. As an author of more than one biography about people who have overcome adversities to attain goals, I know not only the struggles they went through, but also the effect the sharing of their stories has upon others, which is always positive and lasting. Just the kind of story that I need to hear this morning as I face my own adversity which is almost overwhelming me. Courage and Strength! Okay, I got it!